ArmorClad is the industry’s finest epoxy floor coating system and garage floor paint available that can be legally made. Formerly only available to professional installers, ArmorClad is now packaged and available to the public. With over 100,000 ArmorClad Kits sold over close to twenty years, ArmorClad has the highest experience and track record in the industry. Our special Adaptive Molecular Technology (AMT) uses a proprietary cross-linking chemistry unlike ANY other floor coating system available. First, when you etch your floor with our unique ArmorEtch etching solution this creates hundreds of millions of microscopic pores in your floor. Then, when you mix the parts A & B together, a special CHEMICAL reaction starts. During this reaction, the molecules start to bond together into a bond over 100 times stronger than steel! When you apply the ArmorClad to the floor, the cross-linked molecules attach themselves to the pores making them almost impossible to come off! Our 100% solids epoxy chemistry is far superior to low-grade cycloaliphatic epoxy formulations that others would like you to believe are ‘good’ or ‘better’. They are not. 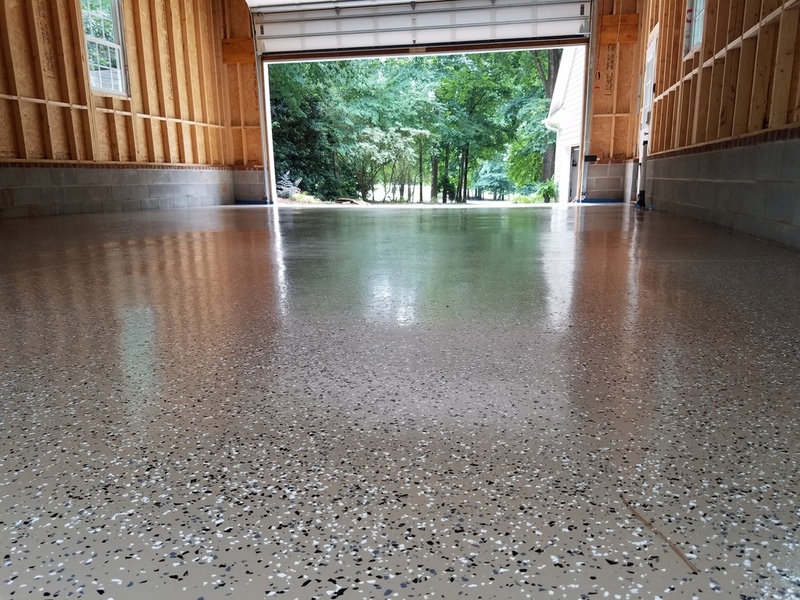 Only our Adaptive Molecular Technology is specifically designed for ease of use and a lifetime of performance for your garage or commercial epoxy floor. Never consider a kit sold at home centers, or from an online company with no real address or facility, as there are many brokers and basement resellers masquerading themselves as ‘manufacturers’. ArmorClad has taken the finest, military-grade epoxy and packaged it into a kit that is easy to apply and will give many, many years of long life and magnificent shine to your floor. No other company offers a superior garage floor paint like ArmorClad. ArmorClad is VERY easy to apply. Everything you need comes in our kits, and NO special skills are required. Just watch our installation video, read the instructions and that’s it! ArmorClad is extremely virtually maintenance-free (keep it clean and free of tire debris of course) and is so easy to apply that it can be applied by a 6th-grader! No special skills or techniques are required to apply Armorclad, and we include in the kit everything you need for a terrific job. ArmorClad is a 100% solids formulation. That means that there is nothing to ‘cure out’ of the epoxy so the thickness you apply it at is the thickness it dries to! It will not shrink as it cures. Lower percentage solids epoxies, cycloaliphatic epoxies, or single component epoxies cannot even come close to the technical performance of ArmorClad. Water-based ‘home center type’ floor epoxies are sub-standard and cannot possibly give the performance of ArmorClad. What will you do (and how will you strip off easily) your inexpensive water-based, thin, low cost floor coating when it fails (usually in far less than a year)? ArmorClad comes in two standard sizes: Master Kit for a 2 car garage up to 600 square feet and Add on Kit that is for a 1-car garage for up to 300 square feet. Kits can be combined to get close to your square footage and leave a reasonable safety factor. All Master Kits include prep/etching solution, mixing bucket, mixer, cut in brush, rubber gloves, topcoat (optional), non skid additive, roller pad, decorative flecks, application squeegee, and complete instructions. Customer service and support is available M-F 9-5 EST with off hours email support 24 x 7. ArmorClad comes in seven beautiful color and fleck combinations, or you can design your own with thousands of variables. See our Design Your Floor link below. ArmorClad also has available primers for floors that have been previously painted or coated or grinded and may be more porous, and upgraded 2 part military grade protective topcoat for garages that are ‘working garages’ and may see fuels and solvents. ArmorClad Kits come in 7 standard color mixes or can be customized to virtually any requirement or color choices. ArmorClad 100% solids epoxy is so strong it can support a huge nail when cured overnight. Try that with a home center epoxy! ArmorClad Installation Video! Click Below!